Provide comfort for the family of William Richardson with a meaningful gesture of sympathy. 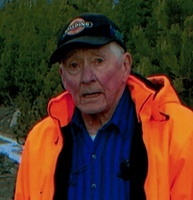 Missoula- Bill Richardson, 82, passed away on Saturday February 23rd, 2019 at his home surrounded by family. Bill was born on October 31st, 1936 on a kitchen table in Ronan, Montana, the only child of Frank Richardson and Sylvia Fisher. After growing up on his grandparents’ ranch, he enlisted in the US Navy where he served until 1955. Bill married his loving wife of 58 years, Darlene Baumgardner on August 27th, 1960 and raised two daughters. He retired in 1985 after a long career as a bakery manager to focus on his family and hobbies. He loved all things outdoors; camping, fishing, and hunting trips with his beloved grandsons and son-in law. Bill is survived by his wife Darlene, daughter Kathy and husband Rick Kamura, daughter Karen Richardson, grandsons Ryan (Nicole), Tyler, and Trevor (Taylor), three adorable great grandchildren Addison, Emersyn, and Landon Kamura, several dear nieces, nephews, and cousins. Bill was a natural craftsman, and was always more than willing to share his knowledge or reach out and help others. His greatest joy truly was his family. He was the most loving husband, dad, grandfather, great grandfather, and friend. Per Bill’s wishes there will be no services. Donations in Bill’s name can be made to Partner’s in Home Care at (406)-728-8848. To send flowers in memory of William C. Richardson, please visit our Heartfelt Sympathies Store.